GnG’s Creative Catering delivers Breakfast, Lunch & Dinner for groups of any size. Take a look at our Catering Menus to see which menu is appropriate for your next event. 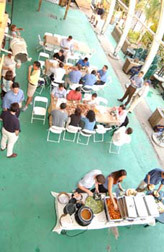 GnG’s Creative Catering caters Special Events of all types: Weddings, Rehearsal Dinners, Bull Roasts, Fundraisers, Cocktail Parties, Summer Picnics, Holiday Parties, Family Gatherings, Crab Feasts, Golf Outings, and more! G&G will pair you with our Event Manager to discuss all the details of your upcoming event: venue, rentals, entertainment, and, of course, menu. GnG’s Creative Catering is happy to assist you with any rental or entertainment needs. Call G&G’s Creative Catering today & speak with our Event Staff who can help make your special occasion unforgettable! Or, email the Event Staff with this Event Inquiry to get a jump-start on your Special Event.